Susan's Craft Room: Last Day of Sale-A-Bration! 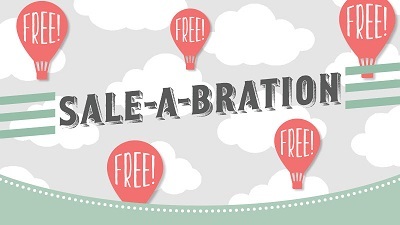 Today is the last day of Sale-A-Bration! This is the last chance to get these limited time FREE products! They will never be offered again. You can place your orders through midnight. CLICK HERE to scoot on over to my website and get your order submitted! This is a card I made using the Sale-A-Bration stamp set called Hey Chick. The chicken is colored using the new Watercolor Pencils and Blender Pens. 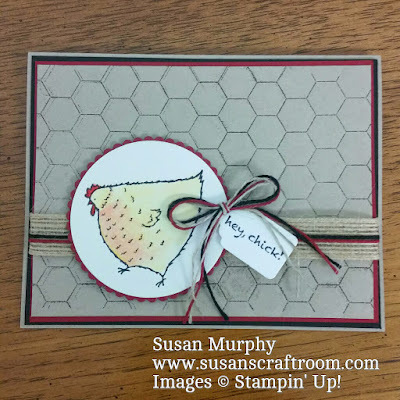 The card is almost an exact CASE of a card made by Krisi Gray that I found on Pinterest. You can see her card on her blog at www.stampingwith kristi.com. Products used in making my card are posted below the card.